The gas giants have always been a mystery to us. Due to their dense and swirling clouds, it is impossible to get a good look inside them and determine their true structure. Given their distance from Earth, it is time-consuming and expensive to send spacecraft to them, making survey missions few and far between. And due to their intense radiation and strong gravity, any mission that attempts to study them has to do so carefully. And yet, scientists have been of the opinion for decades that this massive gas giant has a solid core. This is consistent with our current theories of how the Solar System and its planets formed and migrated to their current positions. 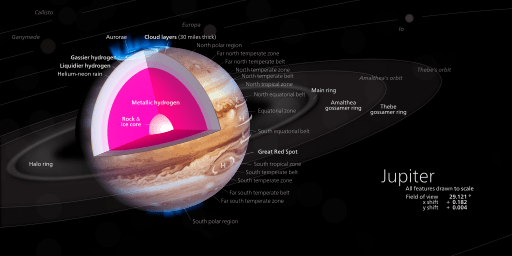 Whereas the outer layers of Jupiter are composed primarily of hydrogen and helium, increases in pressure and density suggest that closer to the core, things become solid. The atmosphere contains trace amounts of methane, water vapor, ammonia, and silicon-based compounds, as well as trace amounts of benzene and other hydrocarbons. There are also traces of carbon, ethane, hydrogen sulfide, neon, oxygen, phosphine, and sulfur. Crystals of frozen ammonia have also been observed in the outermost layer of the atmosphere. 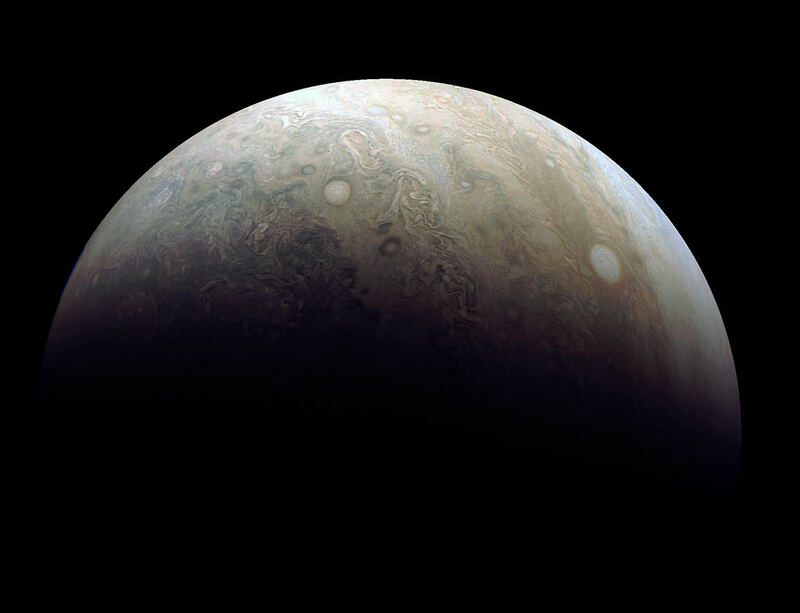 In 1997, the existence of the core was suggested by gravitational measurements, indicating a mass of 12 to 45 times the mass of Earth, or roughly 4%–14% of the total mass of Jupiter. The presence of a core is also supported by models of planetary formation that indicate how a rocky or icy core would have been necessary at some point in the planet’s history. Otherwise, it would not have been able to collect all of its hydrogen and helium from the protosolar nebula – at least in theory. Jupiter acquired most of its mass from material left over from the formation of the Sun, and ended up with more than twice the combined mass of the other planets. In fact, it has been conjectured that it Jupiter had accumulated more mass, it would have become a second star. This is based on the fact that its composition is similar to that of the Sun – being made predominantly of hydrogen. In addition, current models of Solar System formation also indicate that Jupiter formed farther out from its current position. In what is known as the Grand Tack Hypothesis, Jupiter migrated towards the Sun and settled into its current position by roughly 4 billion years ago. This migration, it has been argued, could have resulted in the destruction of the earlier planets in our Solar System – which may have included Super-Earths closer to the Sun. While it was not the first robotic spacecraft to visit Jupiter, or the first to study it from orbit (this was done by the Galileo probe between 1995 and 2003), the Juno mission was designed to investigate the deeper mysteries of the Jovian giant. These include Jupiter’s interior, atmosphere, magnetosphere, gravitational field, and the history of the planet’s formation. The mission launched in August 2011 and achieved orbit around Jupiter on July 4th, 2016. The probe entered its polar elliptical orbit after completing a 35-minute-long firing of the main engine, known as Jupiter Orbital Insertion (or JOI). As the probe approached Jupiter from above its north pole, it was afforded a view of the Jovian system, which it took a final picture of before commencing JOI. Since that time, the Juno spacecraft has been conducting perijove maneuvers – where it passes between the northern polar region and the southern polar region – with a period of about 53 days. It has completed 5 perijoves since it arrived in June of 2016, and it is scheduled to conduct a total of 12 before February of 2018. At this point, barring any mission extensions, the probe will de-orbit and burn up in Jupiter’s outer atmosphere. Jupiter probably does not have a solid core. Jupiter’s core contains some rock and hydrogen metals. Scientists can not be 100 percent certain if deep within the planet there is a solid core or not, but based on gravitational measurements compared with Earth’s, the best educated guesses possible based on those measurements say there is no solid core. Those measurements make them think that the core is a thick, super hot soup. Jupiter’s composition is more of a mystery than anything else. The accepted theory holds that it consists of a dense core made of a mixture of elements, the core is thought to be surrounded by a layer of liquid metallic hydrogen and helium, then the outer layer is to be dominated by molecular hydrogen. The core is often speculated to be rocky. It wasn’t until 1997 that the existence of the core was even theorized. Gravitational measurements were taken, indicating a mass in the neighborhood of 12 to 45 times the Earth’s mass, so the proposed core accounts for about 3–15% of the total mass of the planet. The presence of a planetary core follows accepted knowledge of planetary formation. According to this knowledge base, Jupiter would have had to form a rocky or icy core with enough mass in order to capture such a high percentage of gasses from the early solar nebula. Scientists admit that the planet may lack a core at this time due to the high heat and as hot liquid metallic hydrogen mixed with the molten core, carrying it to higher levels of the planet’s interior. The layer of dense molten hydrogen metal extends to the 78th percentile of the planet’s radius. Just above the layer of metallic hydrogen is an interior atmosphere of hydrogen. The hydrogen at this point is at a temperature where there are no distinct liquid and gas phases, so the hydrogen is in a supercritical fluid state. The temperature and pressure increase steadily toward the core. In the region where hydrogen becomes metallic, the temperatures are thought to be up to 10,000 K and the pressure is 200GPa. The temperature at the core boundary is estimated to be 36,000 K and the pressure is believed to be 3,000 to 4,500 Gpa. Since very little is known about the composition of Jupiter’s core or even if it still exists, the JUNO space mission was launched on August of 2011. It should arrive in orbit around Jupiter in 2016. The purpose of the mission is to orbit the poles and clear up some of the mysteries surrounding the planet and the entire Jovian system. We’ve written several articles about planetary cores for Universe Today. Here’s an article about the Earth’s core, and here’s an article about the core of Mercury.